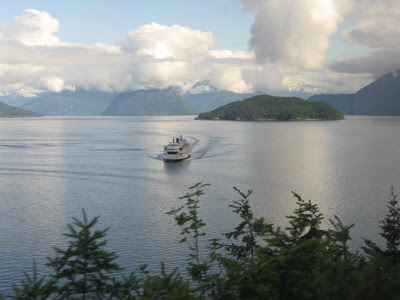 BC Ferries in Horseshoe Bay as seen aboard the Whistler Mountaineer. Sue Frause photo. British Columbia residents are being offered an exclusive BC Resident Special rate for travel on board the Whistler Mountaineer next year. The round-trip fare is only $110, which is the regular one-way fare. For an additional $75, you can upgrade to the Glacier Dome Experience. I went on the three-hour train trip earlier this year, and it's terrific. On the journey From North Vancouver to Whistler in the morning, enjoy breakfast with a view and on the return trip, it's afternoon tea. The scenery is spectacular. The special offer must be booked between Nov. 15 and Dec. 28, 2007 and is good for travel between April 23 and Oct. 19, 2008 when the Whistler Mountaineer train operates seven days a week.